The Communicator is a bit of an anomaly as it is possibly the only genuine 16 bit computer Acorn made. It seems to have been designed as an intelligent terminal for use with Prestel and other early electronic mail/Bulletin board type systems. Details of the Communicator are hard to come by, I have searched both the web and usenet groups with Google and found some contradictory statements. The Acorn entry in Wikipedia says it was produced in 1982, others state it was designed in 1988 (after the launch of the Archimedes). I think that the correct date is 1986. Again the Acorn entry in Wikipedia says it was never sold commercially, but there is definitive evidence that it was used by Pickfords Travel, including an FCO. I think that it was not sold to the general public, and it doesn't appear in the Acorn price lists of the time, but was sold to buiness customer(s). There are statements that it was an modified Electron, but the architecture is very different including the use of a 16 bit CPU. There are statements that the Master Compact reused the case because the Communicator didn't sell. I have checked the case and they clearly are not the same. There are different colour plastic, different ports and a different keyboard layout, in fact, there is little similarity apart from the ridging along the back and the expansion slot on the right hand side. 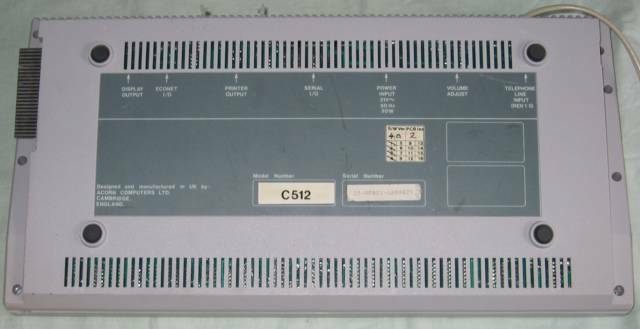 The Communicator has a GTE G65SC816P-2 CPU which is a 16bit version of the 6502 and has a segmented memory. 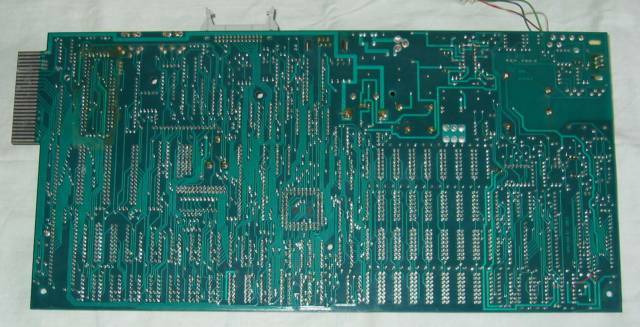 The 65816 was also used in the Apple IIGS. The Communicator is reported to use the Electron ULA (BTW this must date it to 1985 or later when Ferranti was finally able to ship it in volume) but does not contain a Ferranti ULA, instead there is a Mietec IC with an Acorn part no. 0252,602, is this also a ULA? 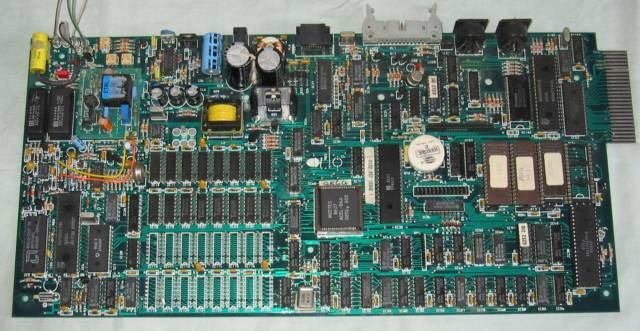 The Communicator has 512K of RAM expandable to 1024K, 32K CMOS RAM and 256K ROM. The applications included in ROM were, View, Viewsheet, Comms and Terminal Emulation. There is no disc storage internally and no interface for external storage. The only filing system interface is Econet and that needs a standard Econet module (as used on BBC Master). It has an integral, BABT approved, modem. The ports are Display Output, Printer Output, Serial (uses a Telephone type connector) and on-board modem. 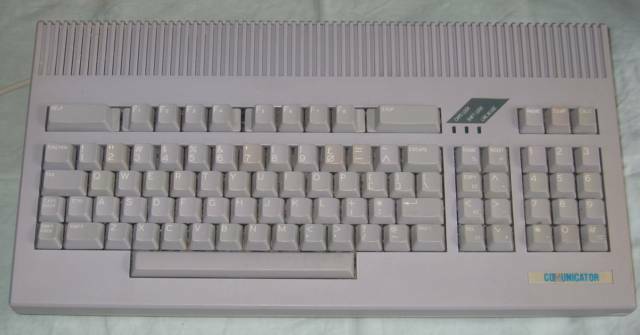 There is also an Italian language variant (Acorn was owned by Olivetti at the time). AFB11 - 512K Italian version. In December 1985 Acorn User published a news item "Communicator's wide appeal". In June 1986 Acorn User pubished a review titled "The Future of the Communicator ". In January 1986 Practical Computing published a review titled "Acorn Communicator Office Work Station ". Here is a Hi-Res picture of the Acorn Communicator . Right hand side of the keyboard showing the motherboard expansion. The back view of the Communicator showing the ports. From left to right, they are Display, Econet, Printer, Serial, Power in and volume control. The cable on the right is the modem cable. The serial port uses a telephone type connector. Here is a HiRes picture of the back of the Acorn Communicator . Here is a HiRes picture of the Acorn Communicator (bottom) . Here is a HiRes picture of the Acorn Communicator without the keyboard . 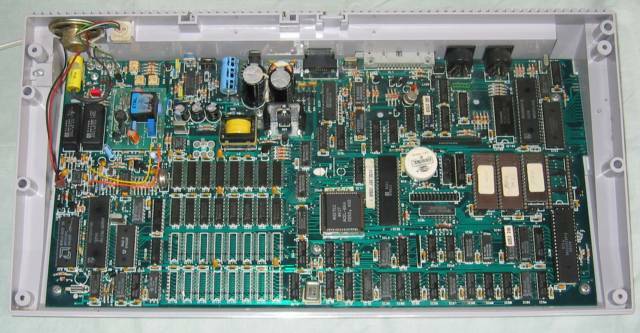 The Communicator's motherboard has its CPU at the bottom right, with the white labled ROMs above it. and the expansion connector at the top right. Along the back are the ports starting with Display on the right, then the Econet port with the sockets for an Econet module just visible in front of it., then the printer port and the serial port. The power in socket is just behind the 2 large capacitors. The volume control is to the left of the blue capacitor. The on board modem is in the top left. On the bottom left, the empty chip locations are where the upgrade to 1024K RAM is installed, with the initial 512K RAM above. Finally the large, square, socketed chip in the middle labelled "Mietec" might be an Electron ULA(?). There is a small hardware fix in the bottom right, made with a red wire.